All you have to do is follow my blog and leave a comment on this post telling me which item you like best! Of course there are other ways to get more entries... May the odds be ever in your favor, and happy love week! I like the beanie and the headband. I love the scarf and beanie! Super cute!!! I am new to your blog and I love it! I am excited to read more. And I have to say that I love the Bow Scarf. I would definitely have to get one for my little girl. I like everything too, but my favorite is the headband. If I ever have a girl she definitely needs the scarf. Loving the striped headband! And if I had a little lady, I'd totally top her cap with the headscarf. Very cute. 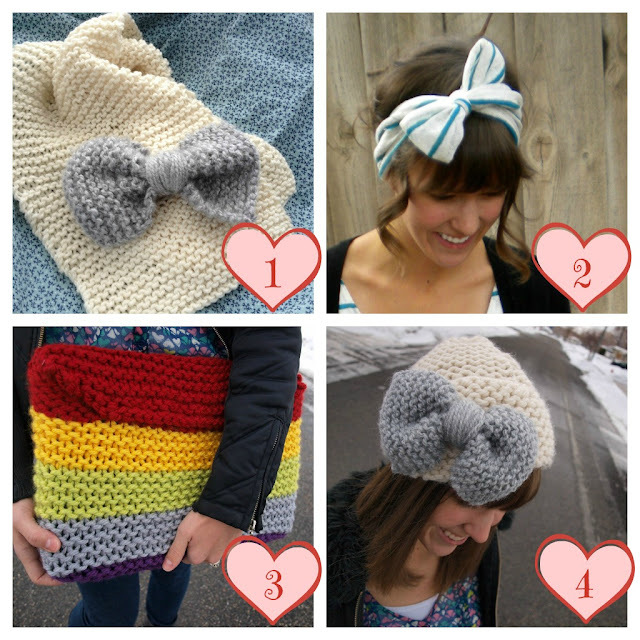 I honeslty love all the items but I love the bow beanie!! Dang I missed the giveaway but I'm a new follower! Welcome to the blog Brandi! Don't fret! I'm planning on many more giveaways on the blog in the future!